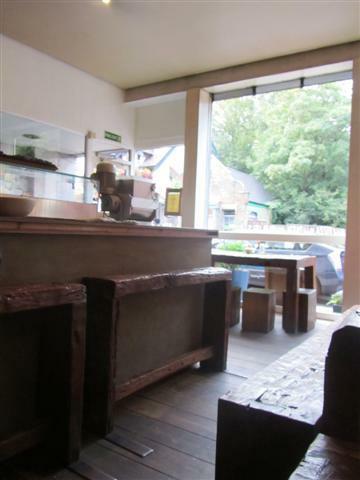 Two huge wooden tables and long benches make up Papa Del’s communal dining area. There are also a few window seats. 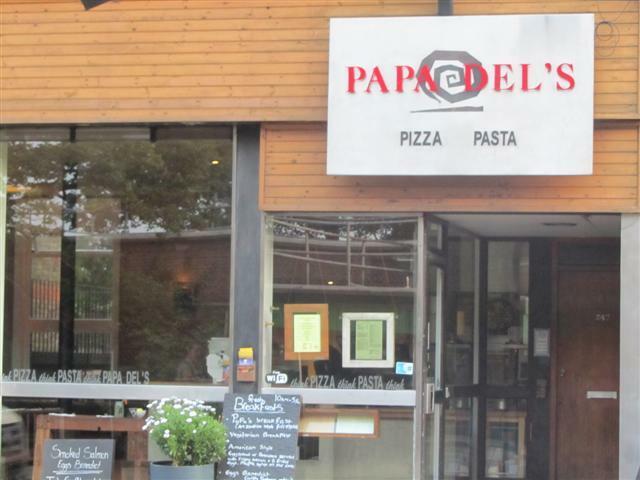 Papa Del’s has a very natural feel to it. The tables are uneven so that slate placemats are used to keep the plates level. 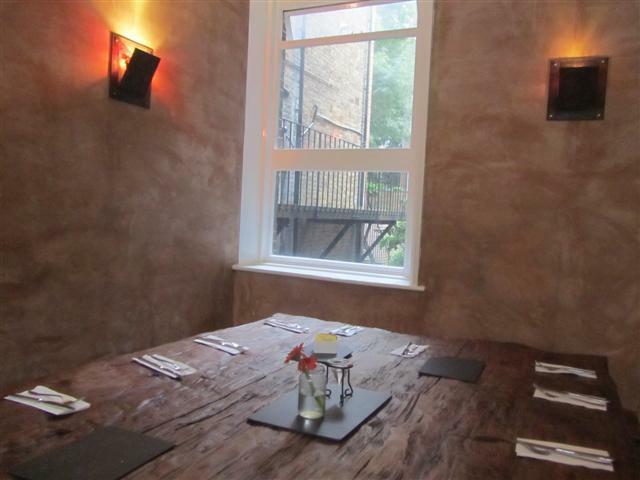 It was nice to have such a dining area with all the wooden surroundings. The painted walls and wall lights gave a soft ambiance. 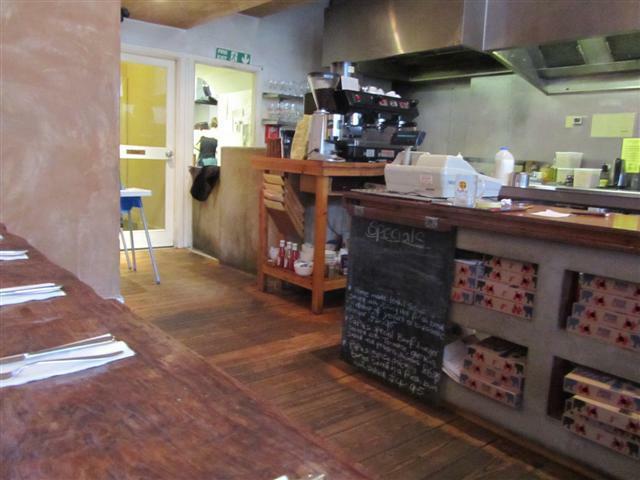 The food was cooked fresh in the open kitchen and so we were waiting a short while for it. The Vegetariana pizza had a thin crispy base and the tomato sauce was tasty. 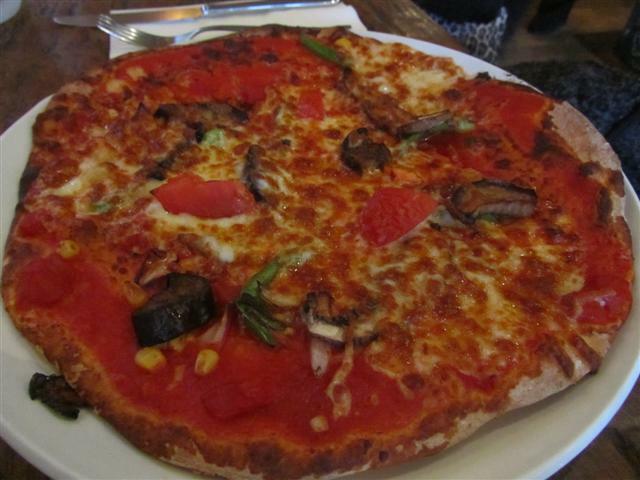 It was topped with tomato, mozzarella, sweetcorn, onions, peppers and mushrooms. We had an additional topping of aubergine. The vegetables were all cooked perfectly. The Penne Arrabiata was a big portion. 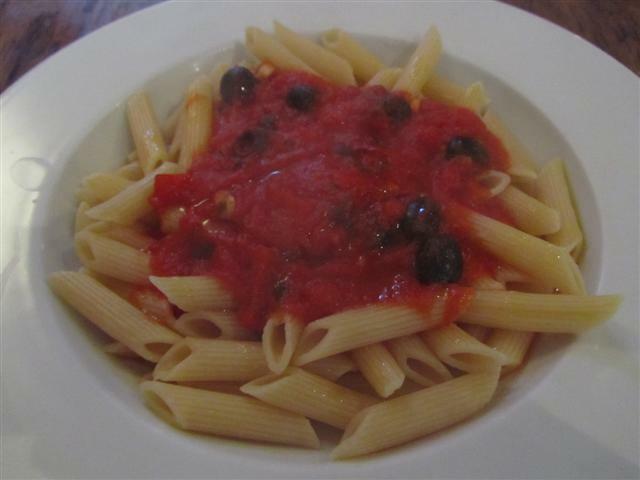 The pasta was topped with a sauce of garlic, tomato, olives and chilli. The sauce had a good flavour and it definitely had a spicy kick to it. The staff were friendly, but there was a slight language barrier going on. A few times when we asked the staff questions, they just said that they did not understand. Luckily, we had the patience to try and explain what we meant in several different ways. Papa Del’s does a good evening deal between 9pm and 11pm. It is also open in the morning for breakfast. There are 22 teenage girls there tonight … Someone’s birthday party, I guess. My diavolo pizza toppings were uneven – nothing but tomato paste on about a third of the crust. Other than that, it was a decent meal.